Toshiba's newest Gigabeat comes in two dozen different guises. 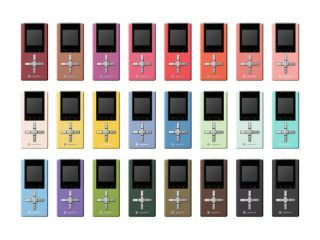 Although it clearly isn't a candidate to become the long-rumoured flash-memory Zune , Toshiba 's newest Gigabeat audio player comes in more colour variations than we'd have thought possible. The ¥13,800 (£55) Gigabeat U103 is available in Japan now in a choice of 24 different hues, ranging all the way from black to sky blue. Aside from the rainbow spectrum of casings, there's only 1GB of flash memory on board, which makes the U103 likely to end up in the hands of kids or newcomers to DAPs seeking a shallow learning curve. An FM radio and transmitter plus a 1.1-inch, 96 x 96-pixel OLED screen add some lustre to the matt-finish aluminium package. Battery life is 20 hours, but 10 minutes connected to a USB port will yield enough power for three hours of playback. Even though the U103 isn't going to move mountains at least - at just 38g - it's 2g lighter than an iPod nano.